Big week for Wild Cards, boys and girls. We have a new post just up on the Wild Cards blog, this one by yours truly. It was my turn in the barrel (we try to upload new content to the blog every two weeks, if not sooner), so I turned out a history of American Hero, our Wild Cards universe hit reality show — from its origins in the fevered imagination of Carrie Vaughn, through its epic first season as chronicled in Inside Straight, and on to the eight seasons that followed. Lots of cool material there that has never been published before, even in the books themselves, so this is a bit of a peek behind the curtain. I hope you’ll enjoy it. And while you’re there, check out some of the other posts on the blog as well, they’re all fascinating in their own ways. Meanwhile, the official publication date of Wild Cards volume twenty-five, LOW CHICAGO was earlier this week. Available right now from Amazon, B&N, your favorite online bookseller, or your local bookstore. You can also order autographed copies from the Jean Cocteau Bookstore, though if you go that route you might have to wait a while to actually read the book, since it will be a few weeks until I have the chance to sign ’em. LOW CHICAGO has been getting some terrific pre-publication reviews… from BOOKLIST, from PUBLISHER’S WEEKLY, from KIRKUS. Check them out, they’re all on line. And we’re thrilled to hear that the Science Fiction Book Club will be featuring it as a main selection. If you have never tried a Wild Cards book before, this is a great one to start with; it’s a stand-alone, so you do not need to have read any of the preceding twenty-four volumes to enjoy it. (Of course, many of those preceding twenty-four volumes are available, with autographs, from the Jean Cocteau, should this one pique your interest). The participating writers this time around include seasoned WC veterans John Jos. Miller, Melinda M. Snodgrass, Mary Anne Mohanraj, Kevin Andrew Murphy, and Paul Cornell, and exciting newcomers (new to Wild Cards at least) Marko Kloos, Christopher Rowe, Saladin Ahmed. That’s Marko’s new guy Khan on the cover; I like you’re going to love him. And of course, just a few weeks down the road, Voyager will be releasing the British edition of KNAVES OVER QUEENS, volume twenty-six in the series. All new stories once again, and another terrific entry point to the series. Oh, and there’s lots of exciting stuff happening with the Wild Cards television series we have in development… but, alas, I cannot tell you about that yet, or I would have to kill you. Cheers, and looking forward to picking up Low Chicago! 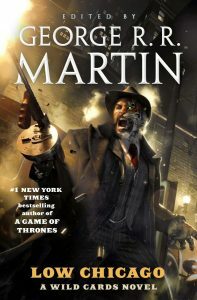 We certainly hope to get the three Baen books (the Cards Sharks triad) reissued by Tor eventually, but first we need to get through ONE-EYED JACKS, JOKERTOWN SHUFFLE, DOUBLE SOLITAIRE, DEALER’S CHOICE, and TURN OF THE CARDS, though that is going to take a while. And of course, it always depends on sales. If the reissues sell well, Tor will continue to do them. If they don’t, well, maybe not. DEUCES DOWN and DEATH DRAWS FIVE are another matter. When iBooks went under, its contracts and stocks were bought up by Brick Tower Press, and they continue to hold the rights to those two titles. They are NOT out of print, you will find. Your local bookstore does not have them, I am sure, but they can probably special order them from Brick Tower or one of the big distributors, like Ingram. So you can get both of those. Whether Brick Tower will ever give them back to us so we can sell them to Tor remains uncertain. They seem to be perfectly content with a tiny trickle of sales. But that’s an issue we can revisit when we have gotten through the last five Bantams and the three old Baens. Thanks for the response and the clarification, George! In the meantime, I’ll look forward to whatever reissues I can get. And if sales are the key factor here, well then I hear nothing boosts sales of a book series quite like a hit TV show based on that book series… though I daren’t stray further down that line of thought lest you send a Faceless Man after me (or perhaps Demise, as the case may be). Annoyingly, here in the UK I am still waiting for Mississippi Roll to be published. Yes, we are getting Knaves over Queens in a couple of weeks, but it is really annoying to be nearly a year behind the US on the others. I wish I could just buy the US e-book, but I can’t without messing around with VPNs and stuff. I have the original editions of the first 15 books, as I bought them all when they first came out. I haven’t read them since, though, so I have been doing a reread of everything while I wait for the new books. I am in the middle of Jokertown Shuffle at the moment. I read a scene yesterday in which Black Shadow contemplates the question as to whether Donald Trump has been jumped. That has an, er, interesting frisson today. Same frustration here! I’ve been waiting for Mississippi Roll for almost a year. I should point out that when we reissue the old books, we often add new stories to them, when the structure allows. WILD CARDS had three new stories and ACES ABROAD had two, and both ONE-EYED JACK and JOKERTOWN SHUFFLE will feature new content as well (from Carrie Vaughn, Cherie Priest, and Kevin Andrew Murphy). We also make revisions and corrections… and that line about Donald Trump is one. More than that I will not say. I have actually bought the e-books of the first seven volumes, even though I already own the original paperbacks – partly because I wanted to read the new stories and partly because I prefer e-books these days. (My eyesight isn’t what it used to be, alas. Also, I like being able to search within the books I am reading). Once on volume 8, though, it was either read the original paperbacks or stop and wait, so the original paperbacks it was. And yes, I am intrigued to see how the 2016 election will unfold in the Wild Cards world. The new book sounds great! For anyone interested in catching up with the long history of Wild Cards, we have a podcast called “Aces & Jokers” where we’re reading and discussing the entire series at acesjokerswildcards.libsyn.com (or search your favourite podcast app). It’ll be a while until we catch up to the new books, though. I noticed Marko Kloos as a contributor. 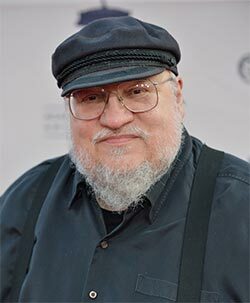 How have you enjoyed his books since your exposure to him at the Hugo’s a few years ago? Yes, very much so. Marko is a terrific writer. I never understood: is Xenovirus Takis-A an infectious disease? Or were all the subsequent outbreaks in the 1940’s due to the initial viral particles that were released over New York City? In which case, the subsequent wild carders from the 1990’s onward are just from genetic descent?